In every generation God has put a hero amongst the Jews to deliver them from their enemies. Now, in a time of unclear future, a time fraught with threats on Israel's very existence at every corner, a savior is needed more than ever. 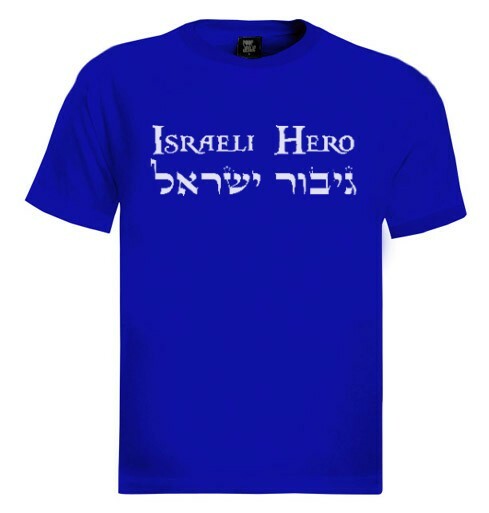 Wear this Israel T-shirt sporting the known Hebrew phrase "Israeli Hero" in honor of the brave leaders of Israel throughout history. Who will be the next hero of Israel? Maybe you? Our t-shirts are made of 100% cotton and are long lasting with bright colors. Our products are all designed and printed in Israel.